JK Body Mounted Tire Carrier for Jeep Wrangler JK 2007-2016. Poison Spyders JK Body Mounted Tire Carrier works with the Stock rear bumper or just about any aftermarket rear bumper, and can accommodate up to a 40 inch spare tire and accessories. 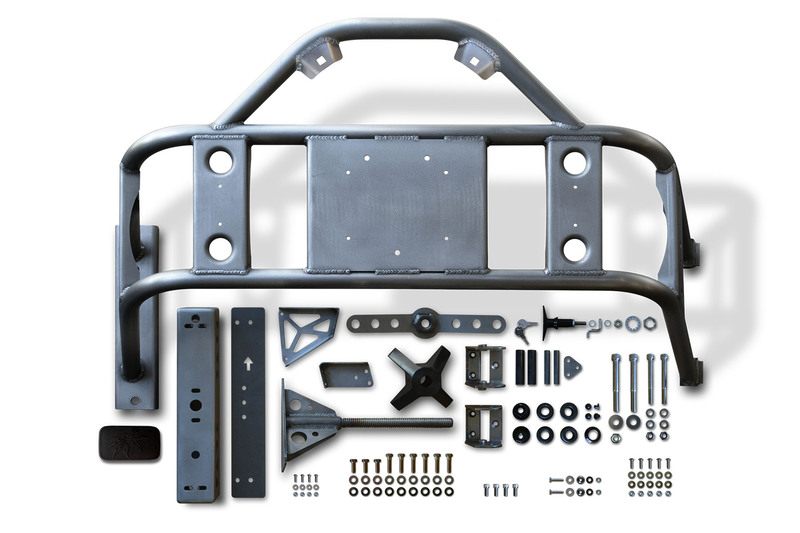 The main tire carrier assembly is made of 1.5 inch DOM tubing for strength and great looks. All of the plate steel components are CNC laser cut and brake-formed from 1/8 inch or 3/16 inch steel plate. The hinge and latch assemblies are designed to address common issues inherent in similar tire carriers from other manufacturers. The tire carrier comes with mounting points to add several Rot-Pax fluid packs as well as a Hi-Lift jack.